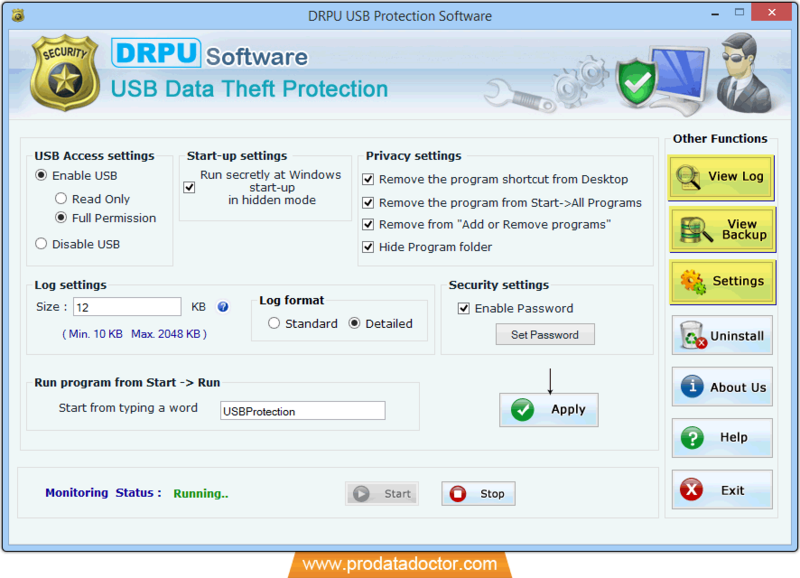 USB Data Theft Protection Tool monitors and saves USB mass storage device activities performed by unknown user and prevents the unauthorized access of USB devices. Anti data theft utility provides facility to record details with date/time when any USB storage media is connected or removed from computer. The administrator is capable to change the access and permission settings of the USB port devices. Data protection tool provides solution to export and import general configuration settings, Email settings and FTP settings if you need to install software in multiple Computer system. Monitoring log file is prepared in HTML format providing the detailed information of USB drive plug-in and plug-out activities in real time. Software also provides detailed information of USB drive activities that includes USB drive Status, Client PC’s Name, IP Address along with date and time, USB Drive Name, hardware ID and device capacity etc. The USB protection software is helpful for any professional organization, investigation Lab, small and large business etc. to remotely monitor USB mass storage media drive activities in hidden way. Software provides facility to track USB mass storage device activities performed by any unauthorized users on your computer. Secretly run and record activities in hidden mode. Enable and disable USB access port from USB access settings. Facility to set password so that unknown user cannot change software settings. Facility to view log details in HTML file format or TEXT file format. Software allows you to send log file via Email and upload log file by FTP server. Software has capability to capture photos by enabling camera on your computer. Facility to view backup of recorded USB device activities. Provides option to Export and import general configuration settings, Email settings and FTP settings (when need to install software in multiple machine). Support Microsoft windows OS including windows 10/8/7/vista/XP/server2000/2003/2008 etc.